This week, during our normal weekend capoeira class at All Souls (10:30 am – 12:00 pm on Saturdays) we spent our time learning an important aspect of capoeira beyond kicks, sweeps and ginga: the music. 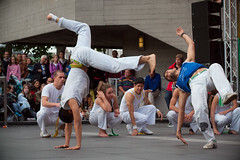 If you’d like to learn more about capoeira music, check out Capoeira-Music.net. It’s got plenty of videos, recordings, written lyrics and tutorials for how to play the instruments we use in capoeira. Here’s a comparison: Do you ever watch the NBA and decide that basketball is too difficult to play? Or see the Super Bowl and think, “Nevermind about that co-ed flag football league, football is too hard!” Or even… watch the World Cup and quit your kickball league? Ok, maybe not that one. But you get my point — there are all levels of capoeira, just like any sport, and we all start somewhere. That starting point in any capoeira class is learning the basic kicks, blocks, sweeps and other moves. As you advance in your skills, you will improve your technique and flexibility, accomplishing more complex moves and combinations. In a typical class, after we finish the warmup the students will practice the basics, which are the building blocks of capoeira regional: the ginga, au, role, esquiva lateral, cocorinha, martelho, ponteira, bencao, queixada, meia lua de frente and meia lua de compaso. Not sure what those are? Beginners receive special instruction on the first few kicks to start learning the names and proper form. After that, we will drill combinations of these moves, such as combining au and martelho or quiexada and meia lua de frente. We also frequently do partner exercises where one capoeirista will practice an attacking move and the other will practice either a counterattack or an evasive maneuver. This type of practice helps you learn how to react when you are facing an opponent in the roda. Finally we finish the class with some stretching and ab exercises. Sometimes we will do a practice roda among students too. Our classes are 60 minutes long on Tuesdays and Thursdays evening classes are both 60 minutes long (they start at 7 pm!) and so are the classes at BloomBars on the weekends (view the kids and adults capoeira class schedule here). If you are looking for more impact, check out our Saturday morning classes. They are 90 minutes long, so we have extra time to practice new moves, drill the basics, and work with our fellow students. Do you have a question about capoeira classes? Please let us know!